Prices range from $9 to $14.50 in boxes of 10. I acquired a couple of the Petit Corona size from the good folks at Cuenca Cigars. 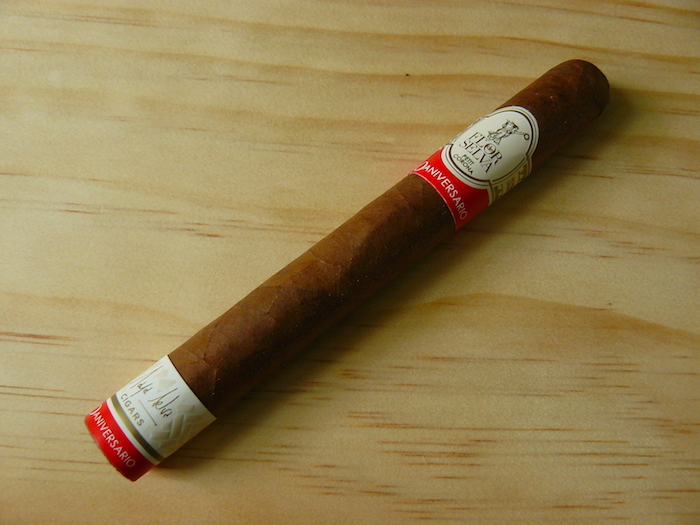 The Flor de Selva Colección Aniversario Nº20 is a nice looking cigar, sporting a light chocolate brown wrapper with a red/orange cast with slight darker mottling. Veins are minimal and the seams are virtually invisible. 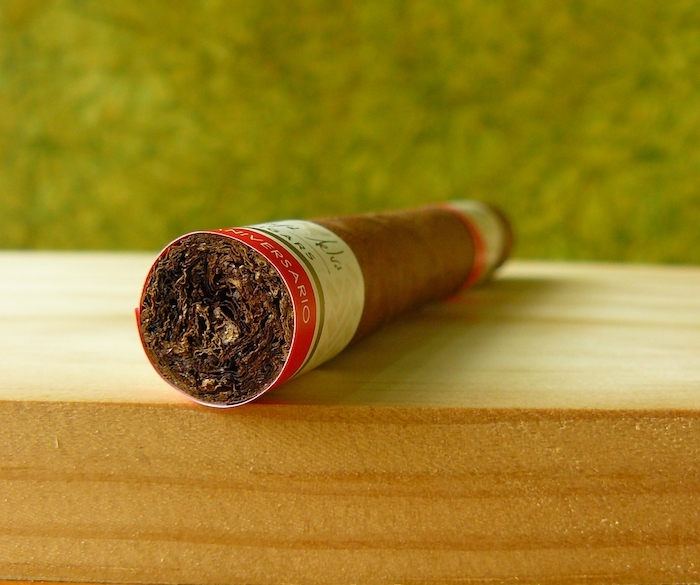 The cigar is extremely firm in its pack, and has a bit of heft to it. I like the simplicity of the color scheme of the two bands, which is red, white, and gold, although the ones on the Petit Corona were obviously printed for the larger vitolas and the wraparound cuts off part of the copy. The aroma off of the wrapper is very light, showing earth, tobacco, and a somewhat meaty scent and dissipates quickly once out of the cellophane. Likewise, the foot scent also requires some effort to pick up, and is mainly natural tobacco. An easy clip of the cap reveals a snug, but tolerable, draw that gives up notes of sweet spice on top of cedar and tobacco. The sweet spice is present in the opening draws of the Flor de Selva Colección Nº20 Aniversario, along with cedar, earth, natural tobacco, and light white pepper. The sweetness soon falls back as the earthiness becomes more prominent. 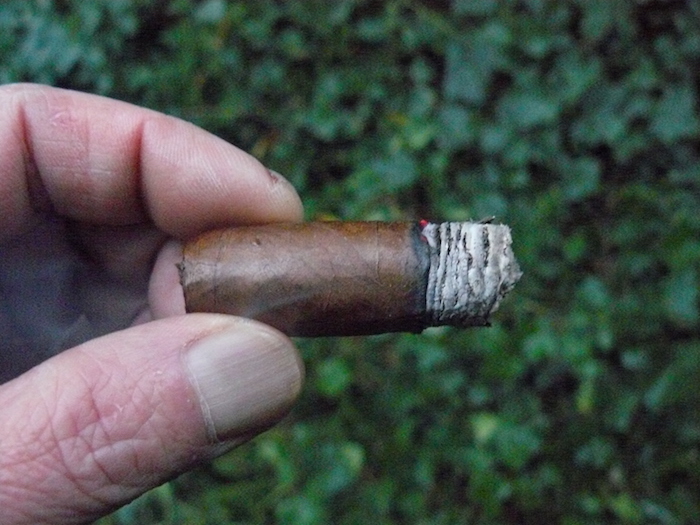 The burn line is fairly sharp and straight, with a layered light gray ash that holds on for ¾”. The earth fades a bit as the flavors blend together in a smooth and balanced mix. The sweetness and earth have been swapping places every few puffs and the pepper has been making a very gradual climb up on the retrohale, as the cigar settles into the medium bodied range. The wood notes have become stronger and darker, as well. Some sourness creeps in, but I find that spacing out the draws a little longer helps to alleviate that issue and turns it toward more of a sweet/sour citrus. As the Flor de Selva Colección Nº20 Aniversario enters its final third, the body, which had moved to the plus side of medium, has shifted back down to medium, melding the flavors together so that no particular one stands out; not necessarily a bad thing. Earthiness once again nudges forward and the cigar burns down to a firm and cool nub, finishing at medium-plus, with low medium strength. First off, I just have to say it: I don’t like the name of this cigar just for the length and the fact that it requires some Alt+codes to type, which is why I avoided doing so as much as possible. Rant over. The Maya Selva Flor de Selva Colección Nº20 Aniversario is a good cigar, and I enjoyed smoking it, even though there is something about Honduran puros that normally don’t quite fit my preferred flavor profile. I think it is the preponderance of that earthy flavor that needs a good dose of sweetness and spice to balance things out for me. I did, however, enjoy this one quite a bit more than I did the more expensive (and limited) No. 20 LE, as the flavors in that one leaned a little too much on the earthy side for me. With its solid construction and the fact that I didn’t have to think about corrections or re-lights, even after letting it sit for an extended amount of time, I think this is a cigar worth giving a shot. 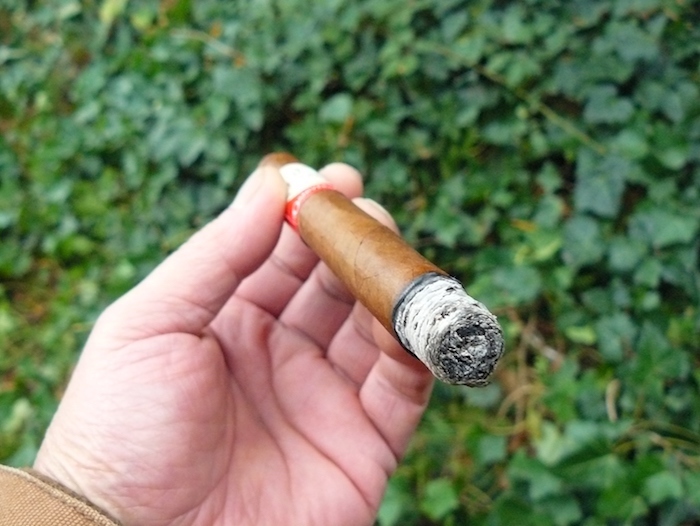 Although the price of $9 for a petit corona seems a bit high, it shouldn’t be a deal breaker for those who love the Honduran flavors, as it also provided a surprisingly long smoking time for a smaller cigar. Matching this cigar with a beer seemed pretty easy: stay away from the bitter brews and ones that would tend to overpower the body of the smoke, such as stouts and quads. 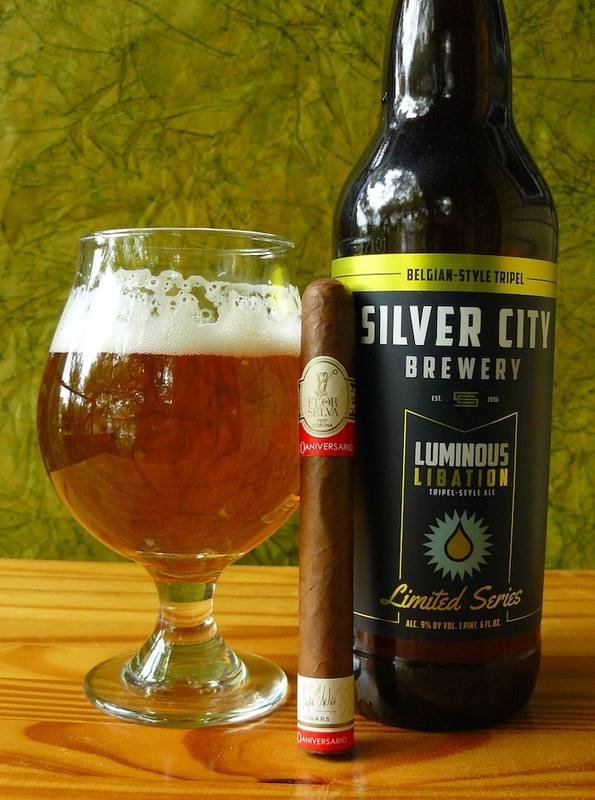 I chose to go with Silver City Brewery’s Luminous Libation, a Belgian Tripel-styled ale. This Bremerton, WA brewery’s creation is pretty much a typical American tripel, with banana, citrus, sour apple, and grassy hops combined with a light sweetness and mouthfeel. 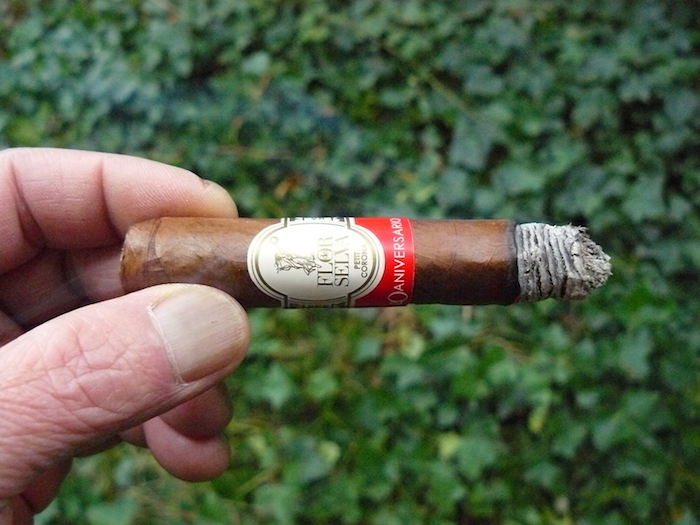 Those flavors played well with what the Flor de Selva Colección Nº20 Aniversario had to give, and helped bring out a little more sweetness from the cigar, while filling in any gaps with its fruitiness. I can also see a sweet, aged rum, or even a sweet sherry or Madeira wine, going well with this smoke.